Balyck Jewellery was started by Jessica Balyck in 2010, at the young age of 23, and has rapidly grown into a respected Australian jewellery brand. Based in Sydney, Jessica designs and creates the pieces herself. Its motto “once adorned, forever transformed” is not only catchy but true of how you feel once you’ve worn her incredible, timeless pieces. Recently, I was lucky enough to interview Jessica Balyck. The interview is below. How old are you? How old were you when you started out? I’m 26 (27 now in November) years of age. When I started studying fashion I was 19 and starting the Balyck label, 23. I read that your jewellery making skills are self-taught. How did you go about teaching yourself? It was through a lot of trial and error, research and watching others that I came to learn the craftsmanship of jewellery making. My father taught me it costs nothing to ask or to call someone to ask questions to learn and so I did just that. I would spend many hours sitting with people talking about the various methods or watching them but then would always have to practice repeatedly myself being the only true way I could learn. You mention that your father telling you that it doesn’t cost anything to call someone to ask questions to learn was valuable advice. Has your Dad been a mentor to you? My father is my hero. He has always encouraged me to do the impossible and pursue my dreams. He guides and advises me constantly even though we are in complete different fields; his belief in what I do is incredible. Did you find that advice rang true? Did you call other jewellers for assistance and did you find they were willing to help or did they see you as a competitor and not want to assist? Thanks to his advice, I took chances and met with people who have aided me through my journey and helped me develop along the way. Not so much other jewellers, more so people within the fashion industry, bloggers, photographers, designers and people who have started their own businesses. His advice indeed did ring true and I quickly learnt nothing will come by doing nothing. When you started your studies at The Fashion Studio in Sydney , did you intend on starting a jewellery brand? No initially, I never intended on starting a jewellery brand. I have always had a fascination with fashion and creating since before I could remember and loved all aspects of it. However prior to starting my course, I would make pieces of jewellery for myself to wear on a daily basis. I then went on to study and pursue fashion. I am extremely grateful I did this as it furthered my abilities to create, gain knowledge on the history of fashion and the styling and creative process. After the course though my passion remained with jewellery as I found I had more passion for it. The starting of the Balyck Label was a gradual process. To begin with I would make designs for myself to wear out and compliment outfits I had. This then slowly caught the attention of my family and friends who I would then create pieces for. Seeing how much they loved the designs and how much I loved creating them gave birth to the idea of starting a label of my very own. This was followed by the long process of research to see if I could make this dream a reality. Do you have any words of wisdom to pass on to fellow designers hoping start their own label? I do. Finding what you love is a gift and if you’re lucky enough to have found one, do it justice by working hard at your trade for the more work you put into something the more results you will see. The results will be addictive. What they don’t tell you is that it won’t just come overnight. Many people have a “gift”; it takes consistent work, though if you love what you want to do, I promise you are already one step ahead. As my father always say’s “it costs nothing to talk to someone to learn” so talk and get in contact with people who have established themselves or have started their own label listen to their process what they have found to be successful or where they have failed and take note. You will be surprised who will be willing to help as we all had to start from somewhere and some of the most amazing knowledge I have gained was just by putting myself out there asking others much more advanced than me if they would like to get a coffee and discuss ideas. Most importantly find your point of difference because sometimes the thing that separates you from everyone else is your sheer determination to succeed. When you are creating a new collection, how do you find inspiration? Inspiration comes to me in all shapes and forms: my surroundings, my dreams and the things I hold close to myself. Often, it’s when I am actually doing things that are non-creative related and am in a relaxed state as I’m not pressured. What is the process for creating a new piece? Do you simply draw it and then create it or do you start playing with the metals etc. to get ideas? Most of the time I start pulling out material in my studio depending on what the theme or inspiration of the collection is (and as you can imagine I would be surrounded by trinkets of all sorts) and through trial and error objects start to form before my eyes. My creative process isn’t really structured or organized prior. I start to create pieces and then let that dictate what will be added or need to be sourced in order to be completed. Sometimes it can take a while as it can be the matter of changing one design feature to differentiate it from being ordinary to extraordinary. I constantly surrounded myself in the fashion world and creative people who share the same passions, my love of travel and most importantly my family. Are you influenced by current fashion trends during the creative process? No not really. I’m appreciative of current fashion though I’ve never been one to be dictated by it. I personally prefer timeless pieces and when buying something for myself or creating, I will always invest in good quality and design, which is what I try to create for people myself. Do you work to a season when creating your pieces? No, I like to create pieces that are versatile and non-seasonal so that people are not limited as to how long, for what or where they can wear them. How many collections do you create each year? For the moment, it is one main collection a year, though shortly I will be releasing the “Trinity” collection which is a bridal capsule collection with The Dark horse and Wedded Wonderland. There will also be the introduction to my new men’s designs to the Balyck Label. One of the things that really appeals to me about your designs, apart from their beauty, is that you are a part of the anti-mass-produced fashion movement. In doing so, you have kept production in-house. Do you have any others in your team that assist with the production process? I solder set and make everything myself in-house though I send the designs out to get plated as I do not have the resources to do this. I like to keep everything onshore as I am extremely supportive of the Australian fashion industry and working with other businesses like my own. I know it would be a lot easier/cheaper to go offshore or have others do the work for me though I think if I did this it would lose everything I love in the first place about creating and bringing special pieces made by myself to my customers. As the label expands though, I know eventually I will need help and I plan to hire other like-minded creatives who have similar passions to help me do so supporting our Australian economy. You do your own designing and soldering but plating is contracted out. So for example, with a piece like the Lion Head Cuff, do you make your own moulds and soldering? The moulds I sketch or I find a photo of an object I like and then that is also contracted out here in Sydney and made for me. But an example of the lion head cuff would be how I found a photo of the lion and asked for it to be made into a mould, I then sourced the base cuff and soldered them together, followed by being sent out to be plated and brought back for me to set the stones and ring. Your pieces are all hand-made in Sydney, how many of each piece do you make? Do you have a cap on how many of each piece you will make or is it simply driven by demand? I Have put a cap of 100 of each design/colour way. As I ultimately would like to build a reputation and be known for that when Balyck releases the main collections, once the pieces are sold out they will not be reproduced. For me, it’s not about mass production though but creating limited pieces that hold special memories to the people who buy them and want something special. What are the challenges in keeping production on-shore in Australia when most fashion brands are opting to have their products made in China? First and foremost cost. Things would be quite significantly cheaper offshore, however I think the quality of Australian made products opposed to Chinese speak for themselves. I also like that I can oversee and control the whole process bringing the finest quality to my clientele. How do you keep your pricing competitive with those brands that are making their products overseas? My label itself targets a niche market that appreciates quality over quantity so the prices are not as cheap as other brands producing their designs overseas though I try when creating and pricing the collection to cater and vary the pricing from low to high so everyone can enjoy and buy from the label. Also, even though the prices may be higher than the mass-produced labels, the Balyck collections are designed and created to be worn many different ways to give customers value for their product enabling them to wear it for a long time opposed to these companies that produce pieces that are seasonal, a current trend or of cheaper quality. Your company is relatively new, having only been launched in 2010. How do you break into the competitive fashion market? One of the most important things is recognising your point of difference and focusing on that. I mould the label around my clientele and target market catering to their needs and what I would like to deliver to them. There are so many talented people competing in the fashion market, however the Balyck label is focusing on a niche market. One of the most beautiful things about Australia and the opportunity it has to offer is that you can immerse yourself in the fashion industry, work hard and make brilliant contacts, which will then lead you to work with the larger labels, celebrities and bloggers. An opportunity, which I think would be a lot harder to come by elsewhere. You’ve said that it is important to recognise one of your points of difference and focus on it. What would you say your point of difference is? I think my main point of focus is everything is made and overseen by myself and made here in Sydney. I want to give the best possible result to my clients and I want them to know that I’m there to deliver all those finer touches to make the product special to them. You’ve said that you mould the label around client and your target market and that you’re focussing on a niche market. Who is your target market? My target market would have to be those who appreciate fashion, quality and timeless pieces. Your latest collection is called The White Lion. Can you please tell us a little about it. The White Lion collection was created to be worn as individual pieces of art or worn all together as a dynamic runway statement. When creating this collection I kept in mind the customer and what I visualized them to feel when wearing the designs. I wanted it to empower them and evoke a special memory of the moment they bought the design and would wear it. I think one of the most important things we have is our memories and if I can provide happiness through my designs for my customers then I have succeeded in everything I want to accomplish. The most important factors of the collection are that they would be versatile and timeless. Does the lion hold a special place for you? The lion Does hold a special place for me. In my travels when I was In Taormina in Italy, I took a beautiful photo of an exquisite old lion door knocker. I loved the quality and craftsmanship of the lion and was instantly inspired to create a collection around this. The name “The White Lion” then contributed to the rarity of the collection and what Balyck jewellery is trying to embody. On your website, it is stated that you were inspired by medieval times when creating this collection. What did you draw your inspiration from? How did you come to be inspired by medieval times? I love history and how we have progressed over time. One of the main things I was inspired by from the medieval times is how they created incredible pieces of jewellery and designs with such limited resources and materials and still of great quality. Do you have a special piece from this collection? 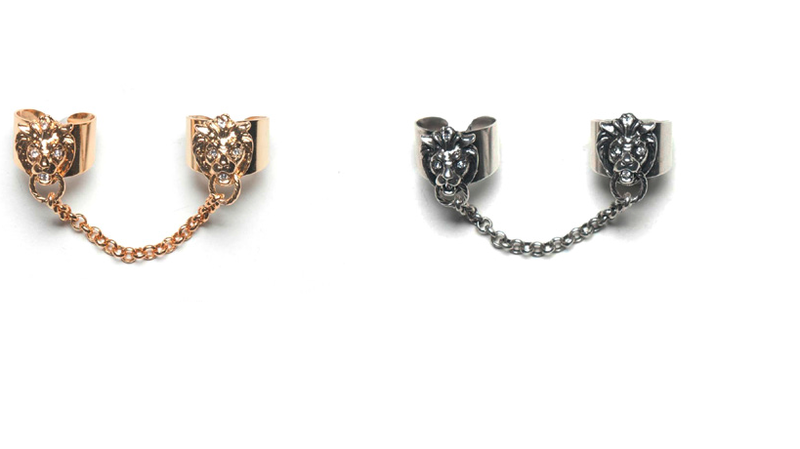 My favourite design would have to be the lion head cuff as it was something I initially made for myself after falling in love with the beautiful door knocker which then went on to give birth to an entire collection. This collection is “limited edition”, again in a move against mass-produced fashion. How many of each piece are you making? Do you have a favourite piece of all time? I made a one-off lion necklace encased in silk that I wear all the time. How about from this collection? 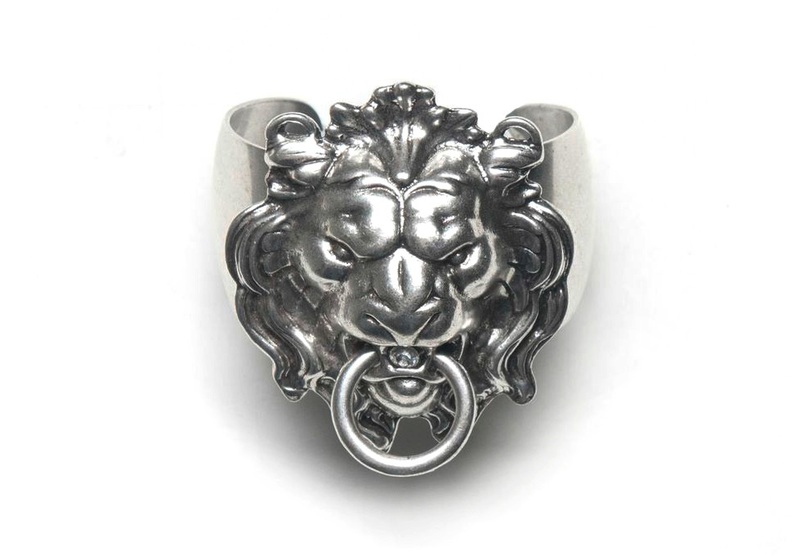 From this collection I wear daily the linked lion rings in silver. What are your best-selling pieces? The linked lion rings have been by far the best seller. How does it feel when you see people wearing your pieces? I am honoured and extremely flattered. When I see people wearing my designs, I feel like I have done my job and am happy to have contributed to the fashion world. It’s all quite surreal really. Have you had any particularly notable moments when someone has worn one of your pieces? Yes, it was a beautiful moment when Dannii Minogue wore my jewellery on Australia’s Got Talent, Karise Eden, the winner of The Voice and working with various Australian bloggers. One of my all time favourite moments was when I was interviewed by FTV for Balyck jewellery, having grown up watching and loving everything about it. How do you feel that your designs have evolved since you started out in 2010? I feel like I have developed stronger branding and sense of direction for what Balyck is and its specific clientele and designing for them. I have learnt further methods of creating and intend on continuing to do so to bring the best quality products to everyone. I intend on continuing to expand into the Australian market and becoming a household name, working with like-minded creative people. Being primarily online focused, I would like to from next year’s collection distribute to shops within Australia and then internationally. Accessarration – Narrating the stories behind the accessories – Why this blog?